Listening to the ocean from all of the rooms in this condo on the 11th floor make this an exceptional find in Waikiki! The large lanai with an unobstructed view of the ocean comfortably seats seven. You'll love viewing the sunsets from here or just enjoying beverages and meals while you watch the surfers, sailors, and paddle boarders. There is a lovely patio and grass seating area available only to guests of the Diamond Head Beach Hotel with tables, chairs, and chaise lounges. The condo sleeps six comfortably (king bed, queen bed, and new queen sleeper sofa). It is a corner unit, large (almost 1,000 square feet, including the lanai). It is on the quiet side of Waikiki very close to the Honolulu Aquarium and the Honolulu Zoo. 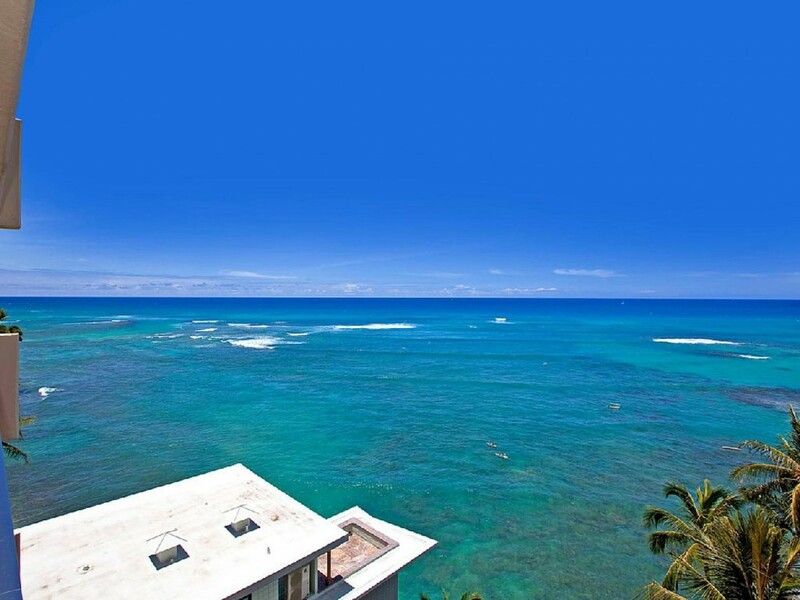 You can swim, snorkel and surf at the best beaches in Waikiki ~ the famous Sans Souci Beach and the Kaimana Beach with calm waters protected by a reef. The hotel is across the street from the beautiful Queen Kapiolani Park. It is the largest (300 acres) and second oldest park in Hawaii. The park has tennis courts, work-out bars, running paths, and many lovely shade trees. Updated in 2017 this condo has everything you need for a wonderful stay, including a new 55" inch Samsung smart television. There is a full-size kitchen (dishwasher, microwave, refrigerator, stove/oven). The kitchen is fully equipped, including a coffee maker, blender, rice cooker, toaster, dishes and cookware. The dishwasher, refrigerator, and microwave are new in April, 2017. Washers and dryers are conveniently available in the building. Our guests do not pay a resort fee. You don't need to rent a car! Exploring Waikiki from here without a car is convenient because it is easy to walk or take buses and taxis. There is a Russell’s convenience store selling a variety of supplies, food, and alcohol just a five-minute walk from the Diamond Head Beach Hotel (adjacent to the New Otani Hotel). The Speedi Shuttle (and other shuttle services) are easy to book online for transportation from and to the Honolulu Airport. There are excellent restaurants within a five-minute walk. Michel’s serving lunch and dinner is in the Colony Surf at 2895 Kalakaua. The famous Hau Tree Lanai is an open-air restaurant in the New Otani Hotel at 2863 Kalakaua and serves breakfast, lunch, and dinner.. The New Otani has two other nice restaurants ~ the Miyako Japanese Restaurant and the Sunset Lanai. Further west on Kalakaua is Lulu Lulu’s at 2586 Kalakaua open from 7:00 a.m. to 2:00 a.m. Cheeseburger in Paradise is located at 2500 Kalakaua open from 7:00 a.m. to 12 a.m. Duke’s, famous for brunch, tropical beverages and live music, is located at 2335 Kalakaua and open from 7:00 a.m. to 12:00 a.m. You will also find McDonald’s, Burger King and Subway in the same area. The ABC stores are excellent for gifts and snacks. If you enjoy shopping, you will like strolling along Kalakaua where there are many local and international shops selling clothing, jewelry, shoes, and souvenirs.